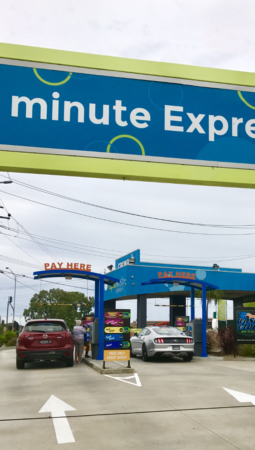 The main feature of our car wash complex is the fully automated Express Tunnel. The Hi-Tech Neoprene Soft Touch materials, combined with specially formulated detergents and waxes and high pressure arch provide a scratch and streak free finish every time. You remain in your vehicle during the whole process and are in and out of the tunnel in less than 3 minutes. Capable of washing in excess of 80 cars per hour means we are sending cars into the tunnel every minute or less, so waiting times are minimal even during the busiest periods. Once out of the tunnel, there are 14 vacuum stations which are absolutely FREE, so you can spend as much or as little time as you wish detailing the inside of your car for no additional cost. The tunnel operates from 7am to 7pm, 7 days per week (subject to weather, we may occasionally close early). The FREE vacuums are available 24/7. This fully automatic machine offers both a ‘Touch Free’ or ‘Soft Touch’ option. The Soft Touch option utilises the same Hi-Tech Neoprene material as the Express Tunnel and the amp sensing computer controls precisely measure the contour of every vehicle, producing an extremely high quality of wash.
Our FusionX is open 24 hours a day, 7 days a week. 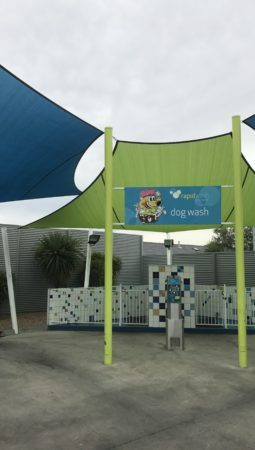 Rapid Wash Express also offers 3 self-serve bays for those who like to do-it-themselves. Offering all your favourite functions and some, such as foaming wax conditioner and air dryers. There is one Super Bay that is 10 meters long and ideal for boats, caravans or vehicles with trailers. This bay also offers a Marine Flush option suitable for flushing engines of boats and jet skis.